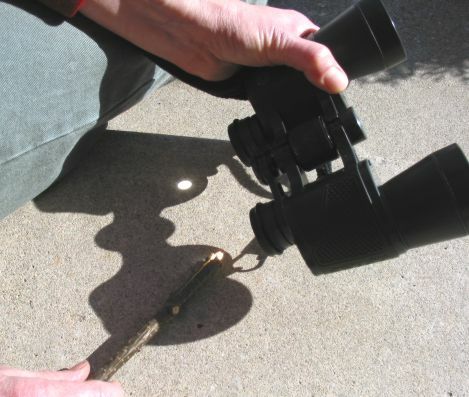 Any sort of magnifying lens may be used to start a fire on a sunny day. This would include a regular magnifying lens, some sort of special magnifier (as shown in the photo below), binoculars, glass bottle bottoms, eyeglasses (far-sighted prescriptions), and so on. 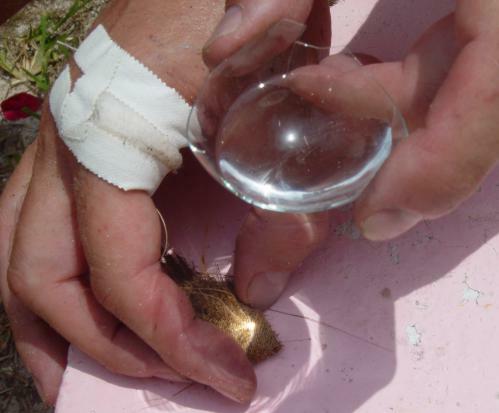 A drop of water on the glass can intensify the sun light even further. You can even buy specialized "burning glasses", which are specially made for concentrating the sun's light for the purpose of starting fires. A pocket magnifier that is about one and a half inches in diameter, with the plastic case that swing away for use, is very handy. 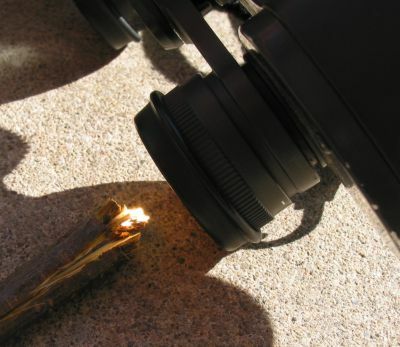 Any avid tracker/naturalist will usually want to carry one around anyway to examine minute plant details for identification, examine micro-details of tracks, start a fire, read fine print, or even hold it in front of your flashlight to disburse the beam in a wider area. Simply hold the lens at such an angle as to focus the sun's light into as small an area as possible. Place some tinder under this spot and it will soon start to smoke and hopefully catch fire. Given the right conditions, this method could even be used to make fire from ice! 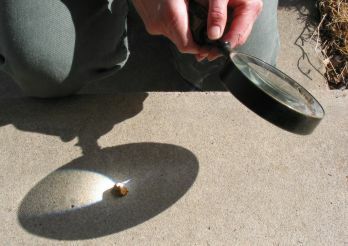 The photo below shows a magnifying glass being used to ignite a small piece of Tinder Fungus. This is fairly easy to do. Just be sure to angle the lens so that the bright dot is as small as possible. And be sure to hold the lens the correct distance from the tinder. The correct distance is when the bright dot is as small as possible, & circular. This photo shows the magnifying lens being used at the wrong angle. The bright dot is dispersing off towards the left. Success! This small piece of Tinder Fungus ignited in less than 5 seconds. Binoculars make an excellent magnifier. Here they are being used to ignite a small piece of Tinder Fungus. Note that the Tinder Fungus is being held in the end of a stick. This helps to avoid burning your fingers. You may not be carrying a magnifying glass around, but people who walk about in Nature often carry binoculars for bird-watching a tree identification (to lok at the leaves that may be 50 feet or more up in the air!). As well, binoculars make a great magnifying lens if you turn them around and look through them the "wrong" way. 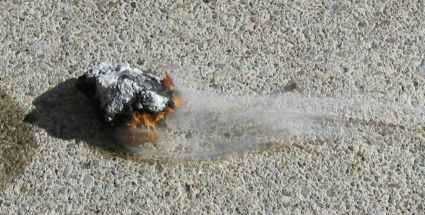 Close-up view of the Tinder Fungus igniting. In this picture it is just starting to smoke. By the way, this picture amply illustrates why you should avoid looking toward the sun with binoculars!! 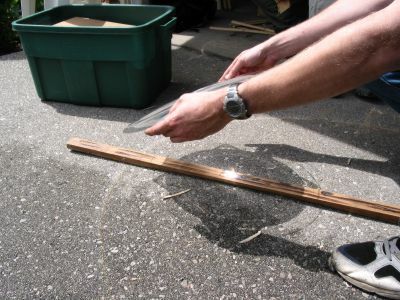 This shows a large lens from an overhead projector being used to set a stick of wood on fire directly, without the use of tinder. This is possible because it is so large, and is specially designed to strongly concentrate light. Yes, fire from a light bulb! 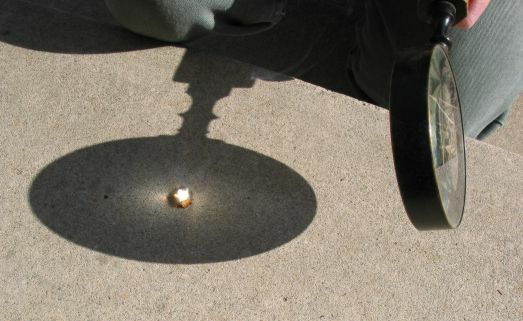 Here is a broken transparent light bulb being used to start fire. A little bit of water is added and you have an instant lens!